Bring on the pumpkin!! Yes, another pumpkin post…but hey, it’s fall so this is to be expected, isn’t it?? I’ve never been a big cheesecake baker and only on a couple of occasions have I decided that my cheesecake has turned out well. Yet I keep trying…practice makes perfect, right? Well…practice is what I will continue to do. I have no idea what went wrong with this one. I followed the recipe to the “T”, which as I was so excited about to share, was from one of the most reputable blog sources in Peabody…but something, somewhere, went awry. Don’t get me wrong, the actual cheesecake was perfect – just the way I like it – heavy and creamy….and pumpkiny of course! But the presentation of it leaves a little to be desired. This is the pumpkin swirl cheesecake that didn’t swirl nor did it quite resemble Peabody’s cheesecake whatsoever. And after the great results of my pumpkin spice cheesecake brownies, I was quite disappointed in how this one turned out (or at least looked because it tasted wonderful). I’m not sure if my oven temp is way off kilter or what because the directions were to cook for about 2hrs at 350 degrees F. The cheesecake was already very brown at 1hr 15 min and I turned the oven off at 1hr 30min because the knive came out clean (with just a little bit stuck to it, as the directions indicated). 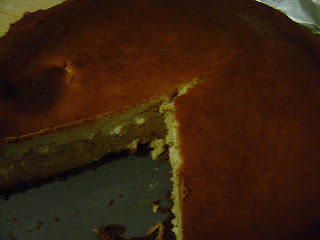 In no way was the inside of the cheesecake overdone but I still don’t know why the top browned so quickly. The browned top doesn’t at all change the flavor, only the all-important appearance. But hey, what can ya do? I’ll consider making this again if I can figure out what went wrong this time. For crust, combine the gingersnaps, and butter. Press onto the bottom of a 10 inch spring form pan. Bake for 10 minutes in 350F oven. Set aside. For the filling, cream the cheese until soft. Add in the sugar and mix well. Add in the flour and mix to blend. Add in the eggs, one at a time, scraping th bowl down after each addition. Add in the yolks and vanilla. Mix well. Remove 3 cups of the batter and place in a bowl. In a seperate bowl, combine the pumpkin, cinnamon, and nutmeg. Stir in the 3 cups of plain cheesecake batter. Layer the two batters in the springform pan starting with the plain batter. Do three layers plain batter and two of the pumpkin batter. Swirl the batters to create a marbelized look. Place the cake on a sheet pan. Place in the oven and pour in hot water to create a water bath. 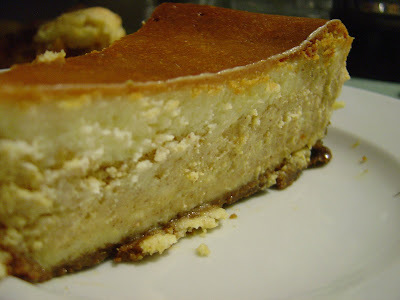 Bake the cheesecake at 350 F for approx. 2 hours. A thin knife inserted in the center should come out almost clean. Cool the cake and then chill. Let sit overnight before unmolding.